Select a product Payroll Leave Attendance Ess Expense Kiosk Visitor Mgmt. Meeting Room Mgr. Managing employee attendance through the conventional musters and maintaining a manual record of leaves, attendance exceptions, etc. is quite simple and hassle-free when you’ve got a few employees to look after. However, with the increase in the numbers of employees, it is necessary that the growth is complemented through the automation of a few aspects of employee management, and that is by deploying employee attendance software within the administrative processes of the organization. Before we proceed to understand the software, let us do a reality check? So, you think, you’ve been saving a lot of money by not requiring to invest in software, and proud about the fact that you’ve been successful enough manually managing it! Well, in that case, perhaps, your pride could be short-lived, as this strategy isn’t healthy in the long run. Something that apparently comes in as a money saver today could actually be costing you a lot of unrealized revenue leakage, and which could be detrimental from the viewpoint of long-term operations. If you haven’t realized this, then it is high time, you make the necessary technological investments, and if have, but have not done anything to seal the situation… it’s yet even more alarming! All in all, you’ve got to resort to technology, as, if you expect accuracy and timely results, it is imperative that you walk the automation way. The software brings in a lot of benefits when deployed at the right time, and with the right customized features embedded. Here are some benefits the Eilisys’s employee attendance software would bring to your table. Real-time availability of information at all times. Automating a lot of complicated and time-consuming tasks. Customized features to suit the specific business requirements. Detailed analytical reports to understand various employee attendance trends. 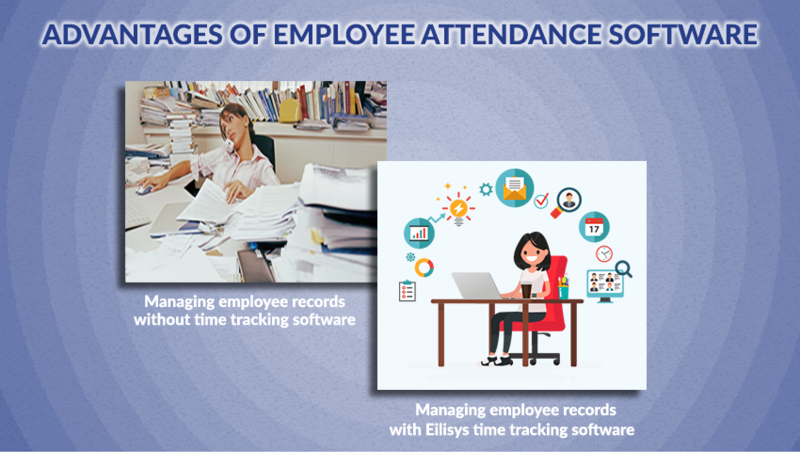 Eilisys’s employee time tracking software simplifies employee management on various fronts that include some of the following. Applying overtime policies by being compliant with the local and national labor laws. Generating compliance reports associated with form20, leave a card, muster roll, etc. Email notification to employees for proposed salary deductions, attendance exceptions, etc. Configurable deduction policies for attendance exceptions. Managing various attendance exceptions including missed punch, late-in, early-out, absenteeism, etc. Easy integration with the existing attendance systems and with payroll systems through the configurable output template. Over 30 standard reports, and the ability to design a customized report with the help of the report writing tool. Shift schedule management with the workflow based approval process. Customized template for specific shift patterns. Sealing revenue leakages through overtime posting based on the pre-approved overtime plan. Customized calculation rules for varying day types including regular working days, weekly off, public holidays, extra time, etc. Automated email notification for attendance exception to the concerned employee. Eilisys’s employee attendance software is a modern solution for modern business owners who wish to keep up with the quick-paced dynamics of employee management. So, if you too are one amongst the prudent business owners, Eilisys’s offers you all the reasons to deploy its employee management software. So, pick up your phone and connect with Eilisys at (+91) 20 6729 5300 today! Technology covers almost everything. Workforce or what you call as human labor is no longer an exception to this powerful technology. Dragging the human resourced into its ambit helps the business organization to function efficiently…. Select a product Payroll Leave Attendance Ess Expense Kiosk Visitor Management. Meeting Room Manger. Subscribe to our newsletters to receive regular news and updates about our new products and sollutions. Copyright © . Eilisys Technologies Pvt. Ltd. All Rights Reserved.